Happy 2016!! Hope you’re enjoying the first day of the new year! It’s time to share my reading plan for the coming twelve months. Reading has always been a favorite hobby of mine. Books help me to learn and grow in every aspect of life. I usually have so many books I want to read that it’s hard to narrow down my list to a set number! I’ve tried different methods the last two years. In 2014, I compiled a list of 50 books for the year, broken down into five categories. In 2015, I chose four books, one in each of four categories, to read every month. This year, I’ve come up with a list of 36 books broken down into three categories. The total number is less than I’ve done in previous years, but I know I’ll be reading other books besides those listed. As I come across other books that I enjoy, I’ll share them here on the blog each month. There will be no particular order to my reading; I’ll just choose a book from my list based on what I want to read next. I need to average three books a month to get this done in a year, so hopefully that won’t be a problem! If you’d like to see other books I hope to read in the future, check out my Pinterest board Books to Read. If you’ve read any of the books on my list, I’d love to know what you thought of them! Have you chosen any books to read this year? I see several books on your list that I read last year! I hope you enjoy them as much as I did, and I look forward to reading what you think about them. Yes, several of my books came through your recommendations! I know y'all must be so excited about the baby coming soon! Can't wait to "meet" her myself when you're able to share about her on your blog. 🙂 I'm sure your older kids will be a big help, too. Take care of yourself!! I always enjoy your reading list. I am currently reading The Law of Happiness by Dr. Henry Cloud. It is a fascinating look at how the science of happiness aligns with the Bible in how God instructs us to live our lives. I am waiting on Strong and Kind by Korie Robertson to arrive. It's the next book I'll be reviewing. The Law of Happiness sounds like a good read. I think I'll be pinning that one for the future! I've never commented here, but I have been enjoying your blog for several months. 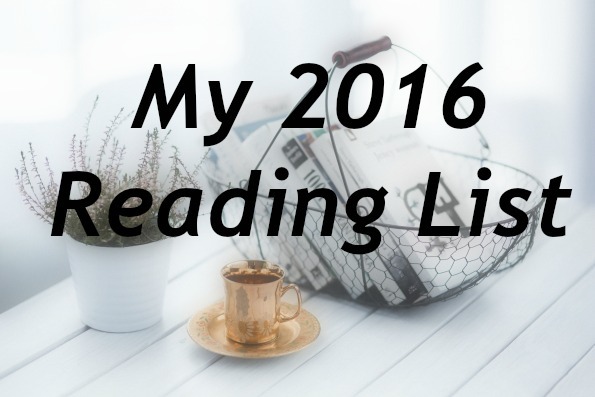 I have a 2016 reading list, as well. Sometimes I think I should read fewer books and work more on putting them into action. I wonder if I am any different three months later than before I read a parenting book or marriage book or other such type of book. Do you have thoughts or tips on such or do you hope it is just somewhat renewing your mind? One of my favorites is Calm my Anxious Heart. It is excellent! Keep a Quiet Heart is another very good book. I look forward to hearing about which ones you like (or don't like). Happy New Year! Thank you for taking the time to comment! It's so nice to "meet" you. I'm a pretty fast reader and I, too, sometimes think I need to slow down and let more of a book's lessons sink into my mind. One thing I've done is created a Pinterest board of "Books to Read Again." These are books that really impacted me and that I think deserve to be read again. For example, I try to read "Stepping Heavenward" (one of my favorite books ever!) at least once a year. I am currently re-reading John Maxwell's 15 Invaluable Laws of Growth because I think it's good for the goal setting we tend to do at this time of year. If I'm reading a particular book on my Kindle, I highlight any sentences or paragraphs that particularly speak to me so that I can go back when I finish the book (or even at a later date) and just review those specific parts. I may also make a quote a draft blog post if I think it's good enough to share with others. One new thing I want to try this year is putting any book quotes I want to ponder on the Notes section of my iPhone. I hope to get into the habit of checking that once a day so that I can keep the words fresh in my mind. My goal would be to have one book quote added each week, so we'll see how that goes! I could also do this in a journal, notebook, or on 3×5 cards, but I'm going to give it a try with my phone first. And, as you mentioned, I do think reading good, quality literature refreshes our mind. I think it's one of the best ways to keep learning and growing even when we're way past our "formal education" years! I'm going to go check out Calm my Anxious Heart! Hope you have a great 2016!! I looked at your board of books to re-read. I have read several of them and have a couple others on my list to read someday. I'm following that board now! Thanks! I hope I find at least a couple of books to add to it this year!